West End Chiropractic Care (New York) - Book Appointment Online! 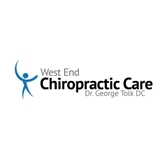 Dr. George Tolk is a chiropractor serving New York and the surrounding communities. Our chiropractor and the rest of the friendly team at West End Chiropractic Care are dedicated to chiropractic solutions to target your unique needs, whether you are suffering from back pain, neck pain, headaches, or even just plain old muscular tightness and tension. You may need pain relief after suffering an accident, experiencing an injury, or if you have a specific condition such as chronic back pain or a spinal condition; even if you just want to improve your overall health, our chiropractor can help you achieve your wellness goals! Please visit the testimonials page to see what our patients are saying about our New York chiropractor and getting regular chiropractic treatments. Explained everything so even I could understand it - it was wonderful and I feel so much better - an excellent experience! !